I absolutely hate when something happens to a piece of my jewelry. Since I often find it on sale/clearanced, it’s not always possible to replace. And even if I could just replace it, that’s not very budget friendly. 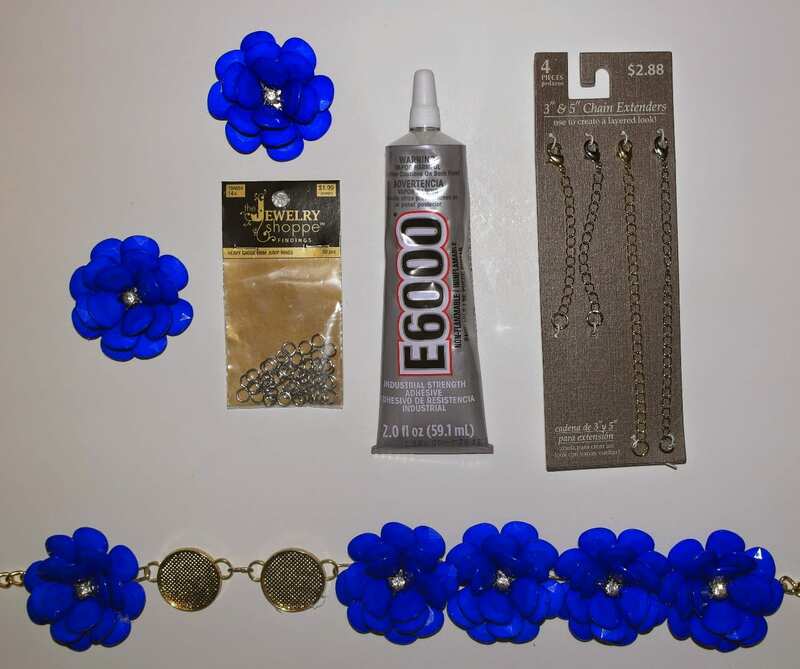 So when 2 flowers popped off of my new blue necklace, I set out to find a solution. I first tried to just hot glue the flowers back on, but they didn’t stick good and just popped back off. I knew I needed something more heavy duty. 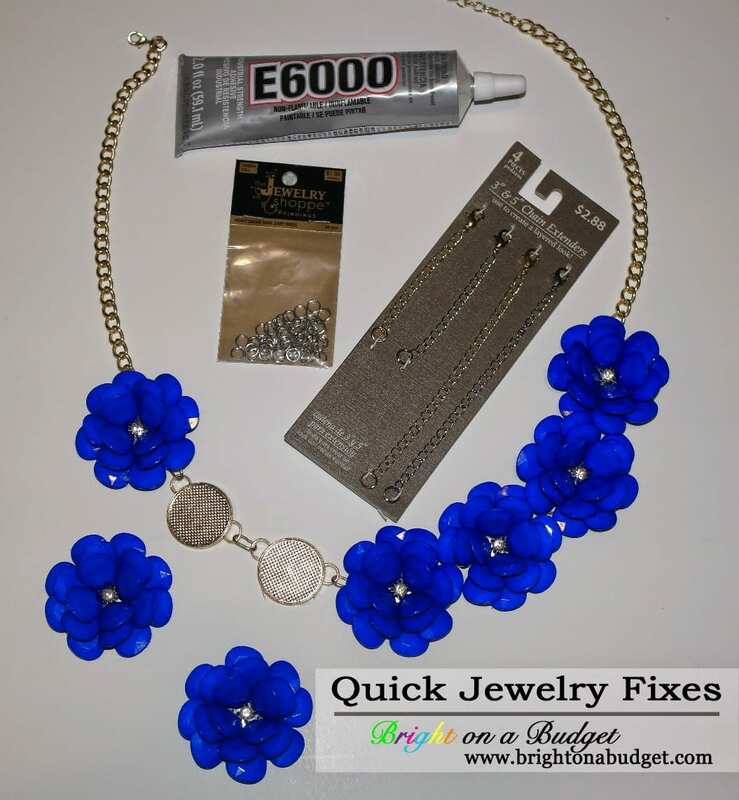 When googling my issue, I kept running across E6000 as the go-to for gluing jewelry back together, so I picked some up at Hobby Lobby. Beware, though–after getting it home and reading the packaging, there are several warnings, so READ the packaging careful and use all precautions! I also have several statement necklaces that I would like to hang down a little bit more, so I picked up the chain extenders. This is the quickest fix of them all–just clip it on to your chain and you’re done! Finally, I have a bracelet that was custom-made, and it’s a hair too short. I got some of these little rings to extend the length just enough to make it perfect. 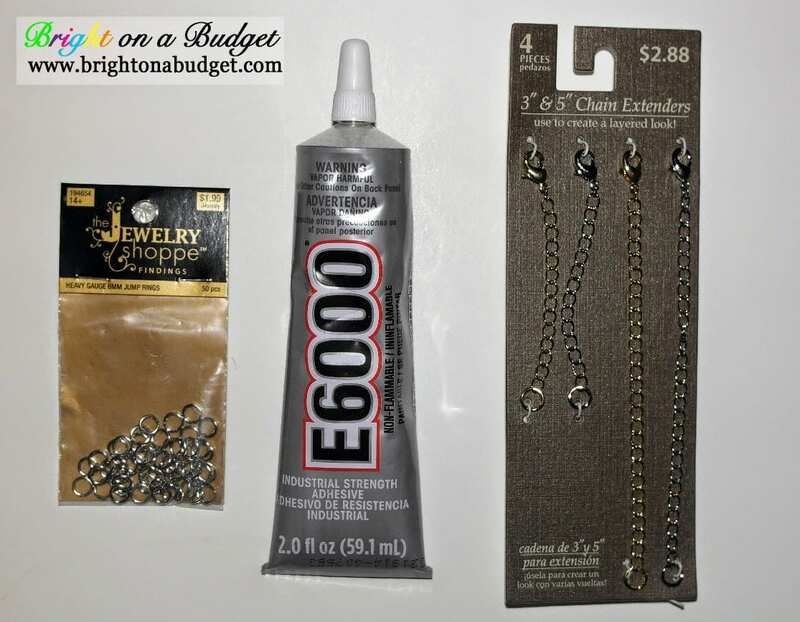 Chain Extenders, $2.88 at Walmart. *You can use Hobby Lobby’s weekly coupon towards the purchase of the first 2 items. Thanks so much for sharing these! I can't tell you how many times I've gotten a necklace caught on something and the whole clasp ends up breaking! That one is so frustrating… I'll have to check Hobby Lobby, because I'm sure they have replacement clasps too! That glue is awesome. Glad you were able to save your jewelry! I've broken so many chains off long necklaces. I have a handful that need minor repairs like this! Thanks for the suggestions!! Thanks for the tip on the glue! I have a similar red flower bracelet that has two flowers missing. You're welcome! And they do have replacement clasps. Walmart has a little all-in-one kit for $4.88. That glue is absolutely amazing, and I'm glad it worked too. I hate replacing stuff. Then you have got to get some of this glue from Hobby Lobby!!! It fixed my necklace right up. Whit, we could have all kinds of blogger-inspired parties;) I tried to sit down and fix everything in that one setting, because I just wanted to get it over with–I'd put it off for too long! Thanks, Logan! I agree about the extenders. They can really change the look of a piece! You're welcome! It's just finding the time to set down and repair them.